A flexible vintage-style drive that apes cranked-amp tones - if you haven't tried a FET-based overdrive before, start here. One of the most natural overdrives we've played. Solid build. Flexible controls. Not ideal for high-gain/heavier styles. 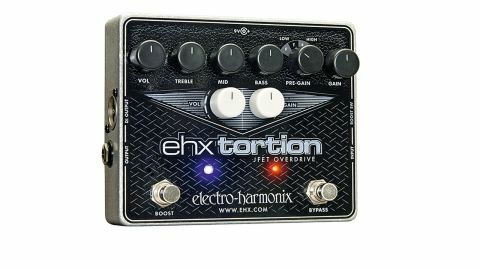 The latest pedal in the barrage of Electro-Harmonix drives, EHX Tortion, is a JFET overdrive with switchable boost, which promises huge versatility and dynamic response. "You can ably transition between a convincing hint of break-up and Page-esque 'Plexi' sounds"
Three JFET stages provide the bulk of the tones, controlled via input gain and four pre-gain settings (low full, low tight, high full and high tight), then tweaked using the three-band EQ and volume control. Activating the boost circuit using the left-hand footswitch adds a fourth gain stage, tweaked with the central volume and gain knobs. You also get an XLR DI output with cabinet simulation, buffered bypass and nine-volt battery or power supply operation. The EHX Tortion's core tones focus on low to medium drives, and they're hugely responsive - by varying your picking dynamics, you can ably transition between a convincing hint of break-up and Page-esque 'Plexi' sounds. You won't get much distortion out of this side, but kicking in the boost ramps the gain up, offering a hefty chunk at 12 o'clock. Anything past that, and the treble gets a little harsh, but up the volume, too, and the EHX Tortion blends beautifully with boosted amps for fat, punchy dirt. For low-to-mid gain styles, the EHX Tortion is among the most natural overdrive pedals we've played. While it won't be your first pick for heavier styles, it's perfect for vintage dirt.